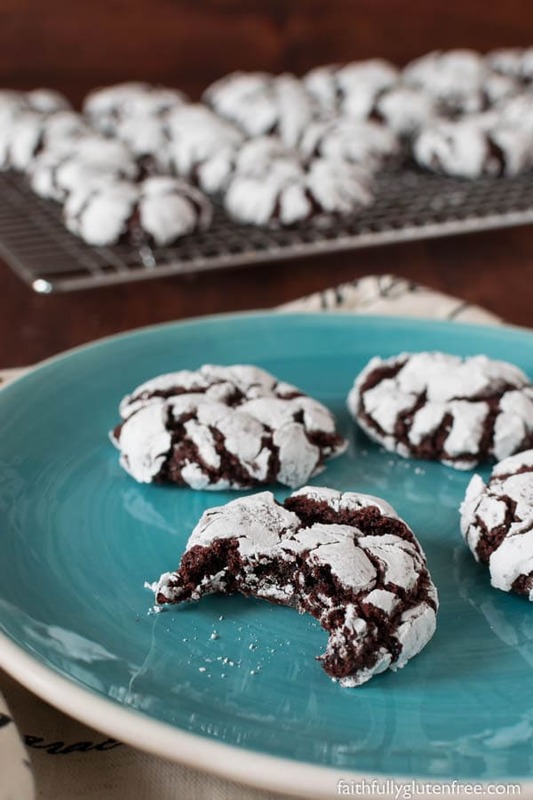 Rolled in powdered sugar, these Fudgy Gluten Free Chocolate Crinkle Cookies are crisp on the outside and soft and chewy on the inside. Who says you can only bake these at Christmas? 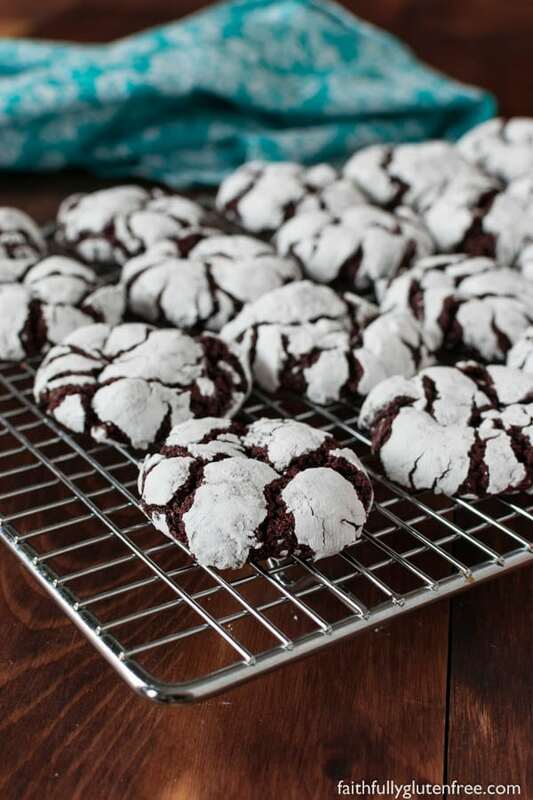 These gluten free Chocolate Crinkle Cookies, or Snowballs as some people call them, are perfectly proportioned to satisfy your chocolate craving. A rich, chewy, almost brownie-like cookie coated in white-as-snow icing sugar. They are so pretty on holiday cookie trays, but don’t cost a lot to make, which is another thing that I love. Starting around the beginning of December, I like to bake batches of cookies and hide them in the freezer. That way when we need to bring treats somewhere during the holidays, I can put together a tray with a variety of cookies. Is anything more pretty than a variety of gluten free Christmas cookies on one plate? I don’t think so. 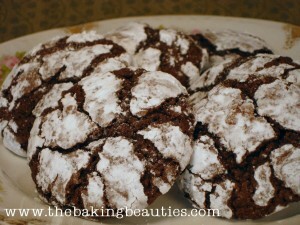 I love being able to chose my favorites, and these Chocolate Crinkle Cookies never last long. Like I mentioned, these gluten free Chocolate Crinkle Cookies freeze beautifully. Just seal in an air-tight container and take out what you need about 30 minutes before serving. This gives the cookies a chance to defrost. When you’re baking these cookies, be sure to refrigerate the dough. A couple of hours, or overnight if possible, will make the dough easier to work with. If you don’t do this, the dough will be way too sticky to scoop. Trust me. Plan ahead. 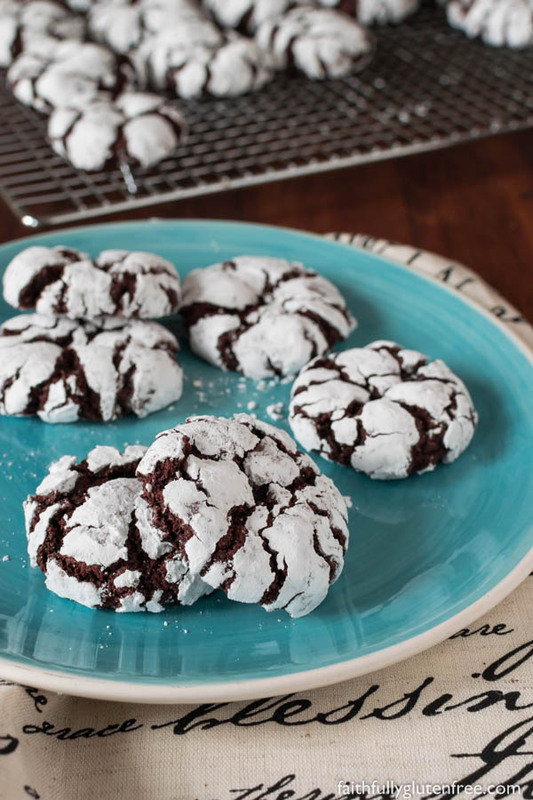 Rolled in powdered sugar, these Fudgy Gluten Free Chocolate Crinkle Cookies are crisp on the outside and soft and chewy on the inside. Don't forget to refrigerate the dough before baking! In a medium mixing bowl, whisk together the cocoa powder, sugar, and oil. Add the eggs and vanilla, and whisk until incorporated. In a separate bowl, whisk together the brown rice flour, sorghum flour, tapioca starch, baking powder, salt and xanthan gum. Stir the wet ingredients into the dry ingredients, and mix just to incorporate (a stand mixer or hand mixer works well for this). Cover with plastic wrap and refrigerate for 3 hours, or if you have time, overnight. When you are ready to bake, preheat the oven to 350 degrees F. Line your baking sheets with parchment paper, and set aside. Place the confections' sugar (icing sugar) in a small, shallow bowl. Scoop about 1 tablespoon of the cookie into the confectioners' sugar (I use my small cookie scoop for this), and roll around to coat completely. Roll the dough into a nice ball and place on the prepared baking sheets, about 2-inches apart. Bake in preheated oven for 10 minutes. Allow to sit on the pan for 5 minutes before transferring to a wire cooling rack. Once cookies are completely cooled, store in an air-tight container. 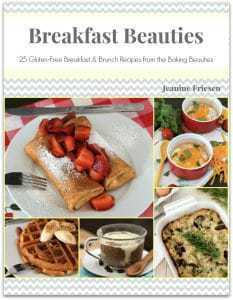 Images and recipe updated November 2018. Mmm these cookies look sooo good Jeanine! They resemble the ones I make using a cake mix. I sure do hope that you will be able to enjoy Christmas this year! Yours look delicious! I’ve been meaning to make these but haven’t gotten around to getting unsweetened chocolate. Thanks! Jill, time to get moving! Only 15 days until Christmas! EEK! 🙂 Thanks again for the great recipe. Can’t wait to try some of the other ones! I’m so glad you’ll get to enjoy Chocolate Crinkles this year, Jeanine! I’ve been making the GF variety for years, and they are sinfully good. Way to go, my friend! I’ve been baking like crazy this week … and making the usual Christmas munchies/gifts too. Where has the time gone?! Yikes! This cookies are so tempting. Look so delectable! I am enjoying this display of fine cookies… It is making me feel better already. 🙂 I will have to try some soon. Maybe I’ll start with these. Yummy! Great recipe. Tried it this year but used the Perfect Flour blend from Namaste as I forgot the Tapioca starch and didn't want to take the time as I was rushed. I enjoyed them. I also added a Mint kiss. Thanks for sharing! I am so glad I had an occasion to make these cookies today. I have always liked chocolate crinkle cookies and was excited to see a GF version. I was even more excited when they turned out (without being flat as a pancake). These are a substantial cookie. I even patted them down after the first batch. It is so nice to have another GF cookie recipe to add to my repertoire. Thanks a bunch! You are an awesome Mom, Elaine! I know your son will be very happy that he can still eat all the treats. So glad that you reminded me of these cookies, I think I must make them now! 🙂 Merry Christmas! Hi there – How many ounces of chocolate does this recipe call for? The four squares in my package of baking chocolate seems smaller than what I recall it being in the past. 4 squares would be 4 oz, I believe. Baking squares should be the same size, I’d think. Hi I’m new to your site and wondering if we can substitute gluten free flour for all those flours listed in the recipe.Your cookies look amazing. Hi Fran, welcome here! 🙂 For cookies, using an “all-purpose” gluten free flour may work, but all the blends are so different, that the results may vary. As long as your blend has flours & starches, and includes xanthan gum, then you could try this recipe using that in place of the flours, starches & xanthan gum in this recipe. I’m not a fan of ‘all purpose blends, you can read more about that here https://www.faithfullyglutenfree.com/substitutions-all-purpose-gluten-free-flour/ but for cookies, you should be okay. You can replace sorghum with the white rice flour and yes you can use white rice flour instead of brown rice flour. It will change the flavor of the cookies slightly, however it should still turn out okay as sorghum flour, white rice flour and brown rice flour are considered all purpose flours along with gluten free oat flour. The fineness of the grind on your rice flour will be the greatest obstacle to success with the switch. You want to use superfine grind white rice flour if at all possible to achieve the same texture as the sorghum flour. I would recommend getting online and ordering in some flours if gluten free is a new thing for you. I live in a remote village in Alaska and Amazon Prime is my best friend for gluten free baking. These are the best cookies I ever ate! I am not kidding! Wow! I never post comments on recipes, but I must say that since I make these cookies 3 times per week, I needed to share my joy! Thank you so much for this wonderful recipe! I also did a vegan batch by replacing eggs for 5 tbsp of water and 3 tbsp of flaxseed meal and they turned out great! I’m so glad I found your site, I just made these cookies and they are so delicious! Thanks so much, Karley! Welcome here!